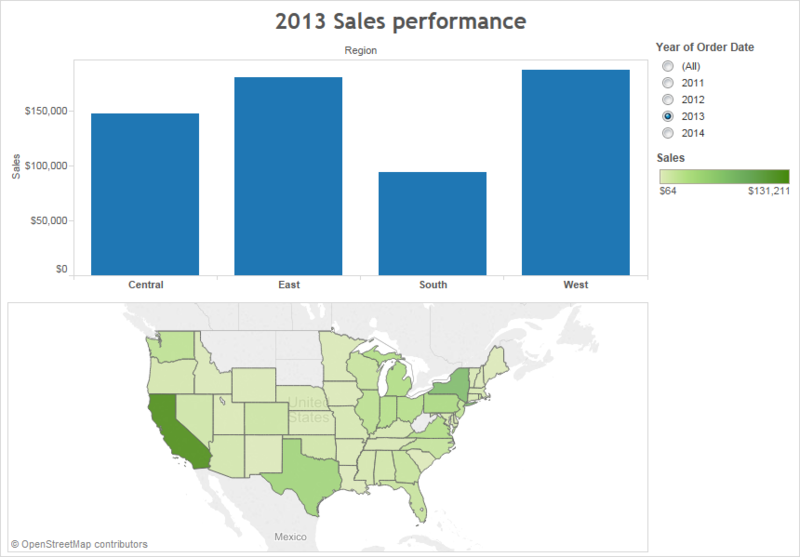 This section describes the basic elements of views that you can create in Tableau. You can show or hide parts of the view as needed (described below). Every view has a table in some form, which may include rows, columns, headers, axes, panes, cells, and marks. Views can optionally include tooltips, titles, captions, field labels, and legends. Data views are displayed in a table on every worksheet. A table is a collection of rows and columns, and consists of the following components: Headers, Axes, Panes, Cells, and Marks. In addition to these, you can choose to show or hide Titles, Captions, Field Labels, and Legends. A. Field Labels - The label of a discrete field added to the row or column shelf that describes the members of that field. For example, Category is a discrete field that contains three members; Furniture, Office Supplies and Technology. B. Titles - The name that you give your worksheet, dashboard, or story. Titles display automatically for worksheets and stories and you can turn them on to display them in your dashboards. C. Marks - The data that represents the intersection of the fields (dimensions and measures) included in your view. Marks can be represented using lines, bars, shapes, maps and so on. D. Legends - A key that describes how the data is encoded in your view. For example if you use shapes or colors in your view, the legend describes what each shape or color represents. E. Axes - Created when you add a measure (fields that contain quantitative, numerical information) to the view. By default, Tableau generates a continuous axis for this data. F. Headers - The member name of a field. G. Captions - Text that describes the data in the view. Captions can be automatically generated and can be toggled on and off. Also see information on Cells and Panes. 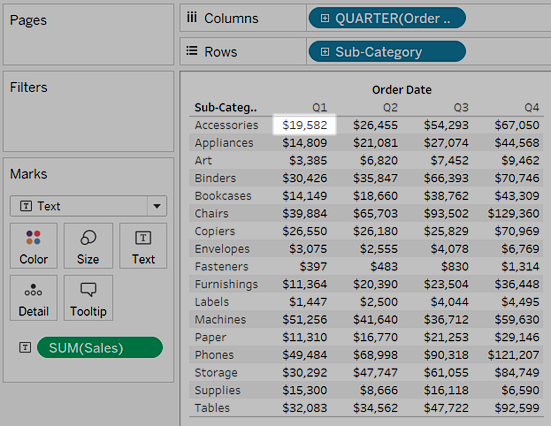 Headers are created when you place a dimension or discrete field on the Rows shelf or the Columns shelves. The headers show the member names of each field on the shelves. For example, in the view below the column headers show the members of the Order Date field and the row headers show the members of the Sub-Category field. You can show and hide row and column headers at anytime. Right-click (control-click on Mac) the headers in the view and select Show Header. Select the field in the view whose headers you want to show and select Show Header on the field menu. Hiding headers can be useful when you are working with multiple measures. For example, the view below shows both the sales and profit for each region along a single axis. You can see the view looks cluttered with the Measure Names headers showing. Because Measure Names is also indicated by the mark color, you can hide the excess headers to clean up the view. Axes are created when you place a measure or continuous field on the Rows or Columns shelves. By default, the values of the measure field are displayed along a continuous axis. You can show and hide axes at any time. Right-click (control-click on Mac) the axis in the view and select Show Header to clear the check mark next to this option. Right-click (control-click on Mac) the measure in the view whose axis you want to show and select Show Header on the field menu. Panes are created by the intersection of rows and columns in a table. An example of a pane is highlighted in the view below. 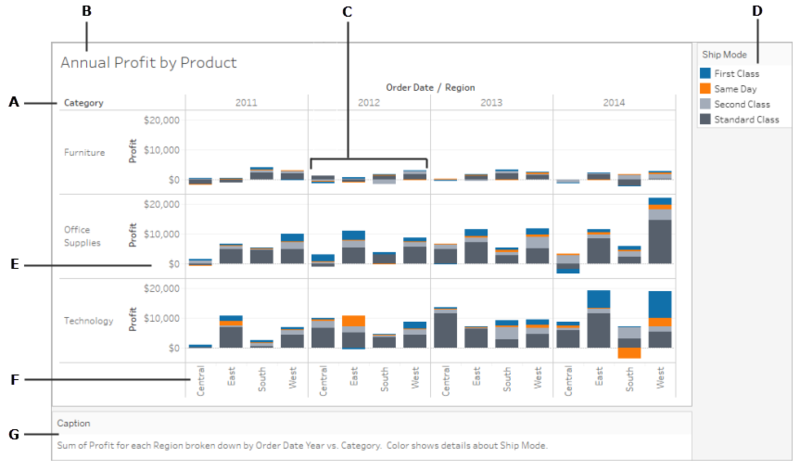 Cells are the basic components of any table you can create in Tableau. For a text table, the cell is the intersection of a row and a column, and is where the text is displayed. For example, one of the 68 cells is highlighted in the view below. When you drag fields to the view, the data are displayed using marks. Each mark represents the intersection of all of the dimensions in the view. For example, in a view with Region and Year dimensions, there is a mark for every combination of those two dimensions (East 2011, East 2012, West 2011, West 2012, etc.). In this case, the mark type is set to Text, so the Abc represents the location where the value for the text mark will appear—once a measure such as Sales is added to the view. Marks can be displayed in many different ways including lines, shapes, bars, maps, and so on. You can show additional information about the data using mark properties such as color, size, shape, labels, etc. The type of mark you use and the mark properties are controlled by the Marks card. Drag fields to the Marks card to show more data. For example, the same view above is shown again below but this time with Profit on Color. With this additional information, it is clear that the West region had the highest profit in 2014. Control the marks in the view using the Marks card. Use the drop-down menu to specify the type of mark to show. Drag fields to the Marks card and use the drop-down controls to add more information to the view and control the color, shape, size, labels, and number of marks in the view. Tooltips are additional data details that display when you hover over one or more marks in the view. When you select one or more marks and hover, tooltips also include options to filter marks (exclude or keep only), display marks that have the same values, create groups, create sets, or display the underlying data. If you don't want users to be able to access tooltip commands, you can disable them. The top of the tooltip lists commands for filtering data, creating a group, sorting the selection, and view the underlying data. For example, you can use the tooltip to quickly remove an outlier in a scatter plot. Each of the commands are described below. Keep Only - creates a filter that removes all other data. 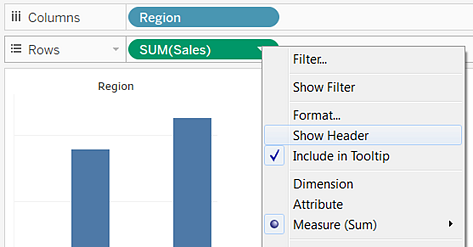 See Select to keep or exclude data points in your view to learn more. Exclude - creates a filter that removes the selected data. 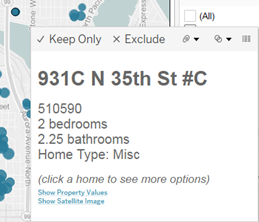 See Select to keep or exclude data points in your view to learn more. Group Members - creates a group based on the selection. If the selection contains multiple dimensions, you can group on one dimension or all dimensions. 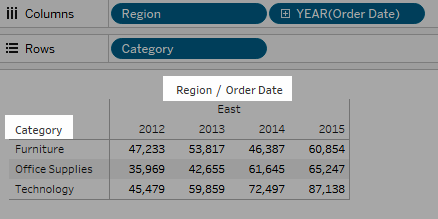 See Correct Data Errors or Combine Dimension Members by Grouping Your Data to learn more. Create Set (Tableau Desktop only) - creates a new set containing the selected members. You can create a new set or add members to an existing set. See Create Sets to learn more. View Data - opens a window displaying the data. You can view the summarized data or the underlying data. See View Underlying Data to learn more. These commands are visible by default. You can disable the commands in the Edit Tooltip dialog box. If you don't want users to be able to access tooltip commands, you can disable them. Click Tooltip on the Marks card or select Worksheet >Tooltip. In the Edit Tooltip dialog box, clear the Include command buttons check box. Tooltip settings apply to the active worksheet and can be different for each sheet in the workbook. The body of a tooltip contains details about a specific mark or a selection of multiple marks. 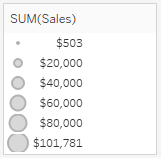 For example, in a bar chart showing sales by region, the tooltip body may include the actual sales amount and the region name. The default tooltip is based on the fields used in the view. You can customize what is shown in the tooltip by dragging fields to Tooltip on the Marks card. To customize a tooltip and its formatting, click Tooltip on the Marks card. Alternatively, you can select Worksheet > Tooltip. If the sheet has any actions, the action links are listed below the body of the tooltip. An action adds context and interactivity to your data through filters, highlighting, and links to external resources. See Actions to learn more about adding actions to your workbook. You can show titles on any worksheet, dashboard, or story. For worksheets and stories, a title is displayed by default, but you can remove it. For dashboards, you can add a title. By default, the title is the name of the sheet, but you can edit the title to change the text and include dynamic values such as page number and sheet name. 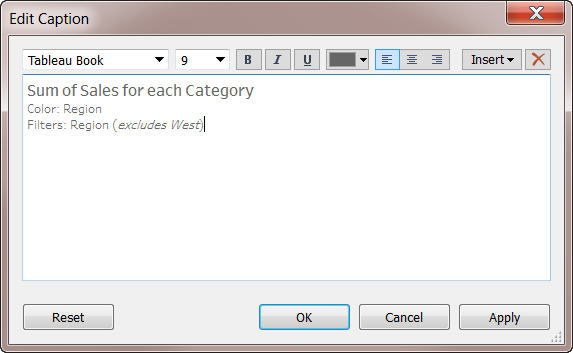 For more information about how to format titles, see Format Titles, Captions, Tooltips, and Legends. Titles are shown by default for worksheets and are included as part of the worksheet, shown at the top of the view. You can move the title to the sides or the bottom of the view. However, when you move the title from the top of the view, it becomes a Title card and displays like any other card in the view. Note: If you move a title from the top position and then hide it; when you show the title again, it appears back at the top of the worksheet in its default position. 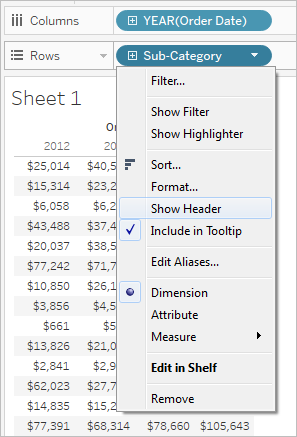 From the toolbar menu, click Worksheet > Show Title. 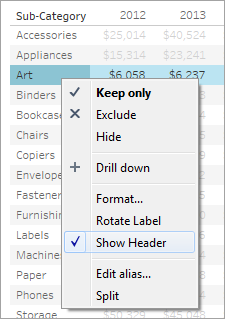 On the toolbar, click the drop-down arrow on the Show/Hide Cards button and select Title from the context menu. Toggle the check mark on or off to show or hide the title. You can turn on titles for dashboards. The title appears as part of the dashboard. To show or hide titles on a dashboard, from the toolbar menu, select Dashboard > Show Title. In the dashboard, select the worksheet to highlight it. In the top right corner of the highlighted worksheet, click the drop-down arrow and select Title in the context menu to clear the check mark. Story titles are displayed by default. To toggle story titles on or off, in the top menu, select Story > Show Title to add or remove the check mark. All views can have a caption that is either automatically generated or manually created. The caption is displayed on the Caption card. To show a caption in a worksheet, select it on the Show/Hide Cards toolbar menu or select Worksheet > Show Caption. The caption is automatically generated by default. To edit the caption, double-click the Caption area in the view. In the Edit Caption dialog box, you can use change the font, size, color, and alignment and style. Click the Insert menu to add automatic text such as page number, sheet name, and field and parameter values. Placing discrete fields on the rows and column shelves creates headers in the view that display the members of the field. For example, if you place a field containing products on the rows shelf, each product name is shown as row headers. In addition to showing these headers, you can show field labels, which are labels for the headers. In this example, the rows are labeled Category, to indicate that the discrete category names are members of the Category field. Field labels apply only to discrete fields. 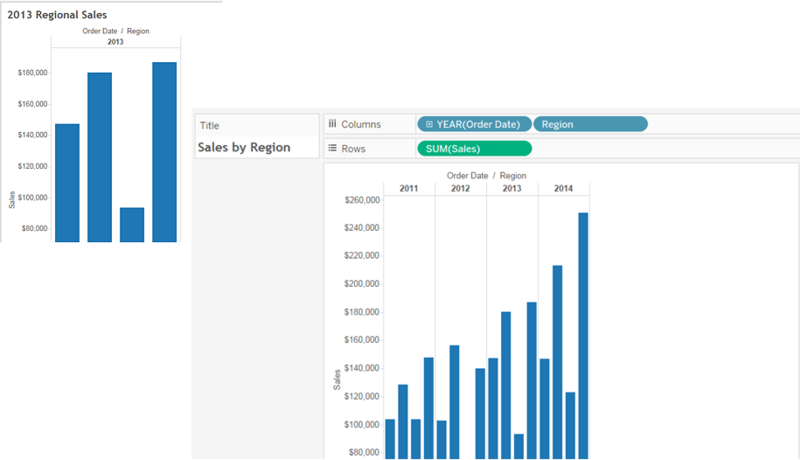 When you add continuous fields to the view, Tableau creates an axis. The axis is labeled with a header. By default, field labels are shown. 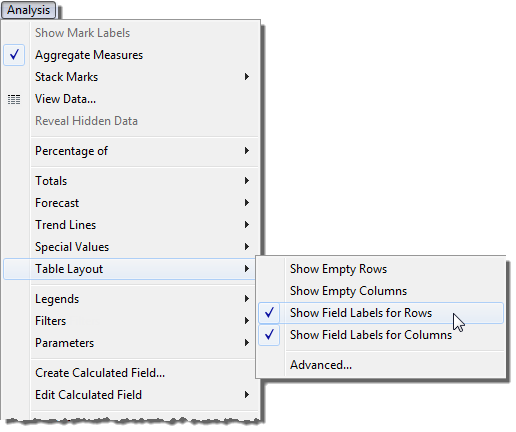 To hide or show field labels, select Analysis > Table Layout > Show Field Labels for Rows or Show Field Labels for Columns. You can format the fonts, alignment, shading, and separators for field labels. When you add fields to Color, Size, and Shape on the Marks card, a legend displays to indicate how the view is encoded with relation to your data. Not only do legends help you understand encodings, you can also use legends to sort, filter, and highlight specific sets of data. For more information, see Legend Highlighting. 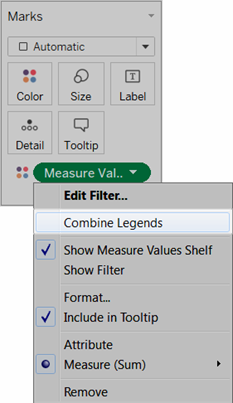 If you include the Measure Values and Measure names fields in your views, you can create either a single combined color legend or separate color legends for your measures. If you drag the Measure Values field to Color on the Marks card, by default Tableau creates a single color legend that applies one color palette to all marks in the view. 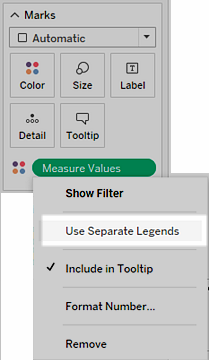 If you want to differentiate certain measures in the view you can create separate color legends for the measures and assign a unique color palette to each legend. For more information about Measure Values and Measure Names, see Measure Values and Measure Names. The following example shows how to create separate color legends. This example uses the Sample Superstore data set. Connect to the Sample-Superstore data set. 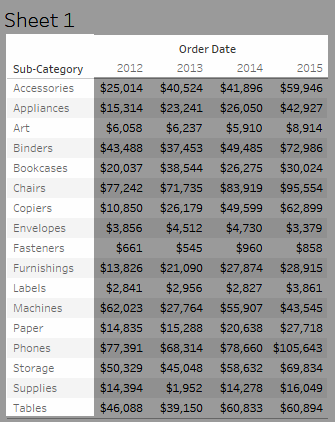 From the Data pane, drag Order Date to the Columns shelf and Category and Sub-Category to the Rows shelf. 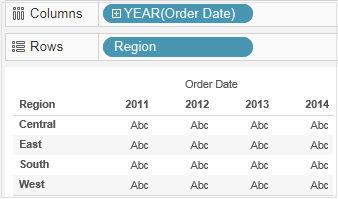 Under Dimensions in the Data pane, drag Measure Names to the columns shelf and drop it to the right of Order Date. Under Measures in the Data pane, drag Measure Values to Color on the Marks card. In the Measure Values card, drag measures off the card so that you keep SUM(Sales), and SUM(Profit) only. Click Label on the Marks card and select Show mark labels to show the measure values in the view. When you drag Measure Values to Color on the Marks card, Tableau creates a single color legend and adds it to the view. Your view should look something like this. 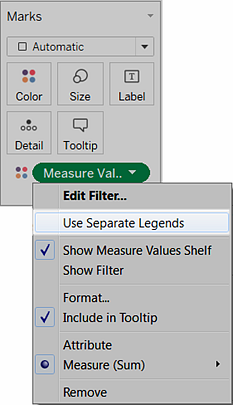 To create separate legends for each measure on the view, click the drop-down arrow on the Measure Values field in the Marks card and select Use Separate Legends from the context menu. 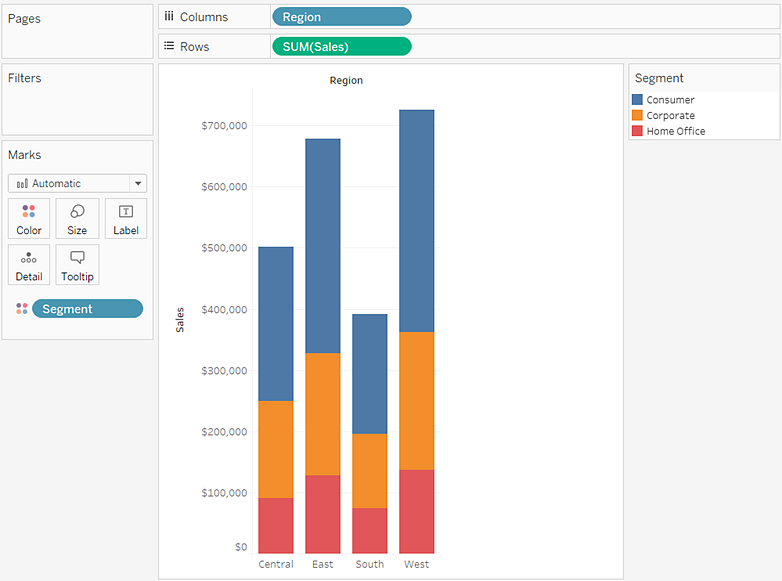 Tableau creates an individual color legend for each measure in the view using the default color palette. 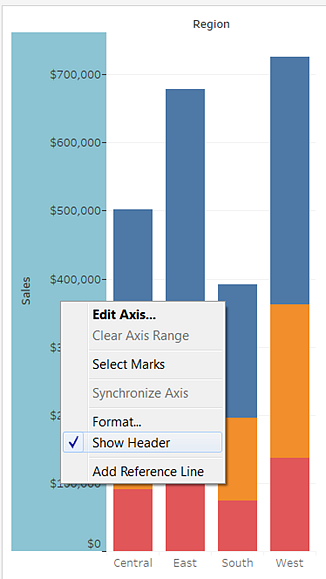 In Tableau Desktop, click the drop-down arrow in the top right corner for each color legend and select Edit Colors. Then select a color from the Palette drop-down list. 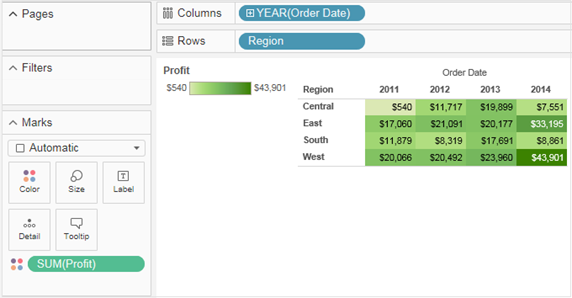 In Tableau Server or Tableau Online, click the drop-down arrow in the top right corner for each color legend. Then select a color from the Palette drop-down list. 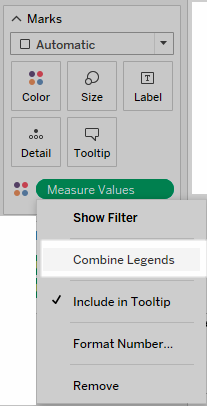 To combine the separate legends back to a single legend, click the drop-down arrow on the Measure Values field on the Marks card and select Combine Legends from the context menu.